A folding lid that opens on either end makes these boxes easy to fill. There’s tons of space under your bed. 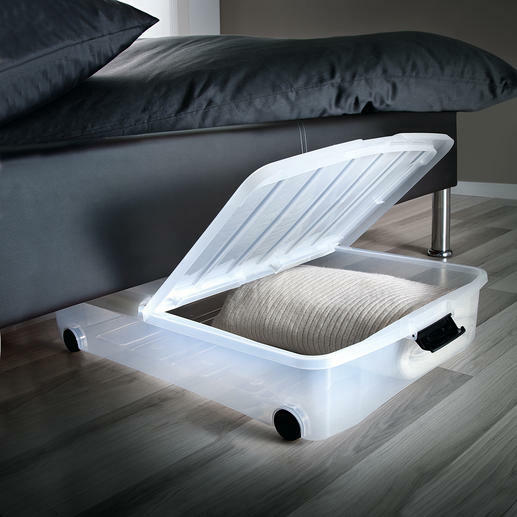 Underbed box with folding lid. At an astonishingly reasonable price. This underbed box is the ideal way to make good use of all that wasted space. Store all the things you don’t need every day under your bed: Thick jumpers in summer, beachwear in the winter. Tidy it all away, neatly sorted in the 50 litre transparent polypropylene box. Just 15cm (6") high and equipped with smooth rollers so it fits snugly under almost any bed. Measures 75 x 55 x 15cm (29 1⁄2" x 21 2⁄3" x 6") (L x W x H). Weighs 2.5kg (5.5 lbs). In a good value for money set of 2.